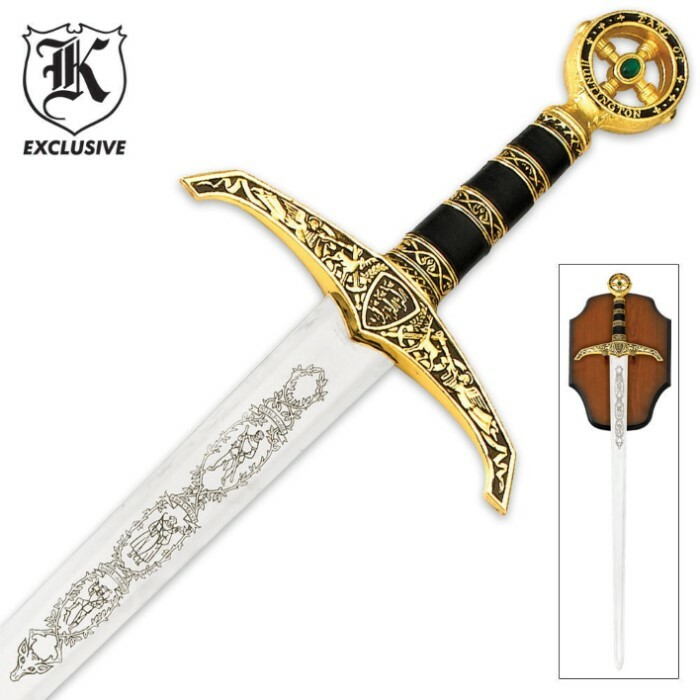 Full Size Middle Ages Robin Hood Sword And Wall Plaque | BUDK.com - Knives & Swords At The Lowest Prices! This mighty sword was wielded by Robin Hood while on the Third Crusade and in England. Measuring 48" overall, this impressive sword features a double-edged 38" stainless steel blade with laser etchings and a Medieval blade pattern. The pommel features an emerald gemstone mounted in a cross design. It also bears the legend of "Robin of Locksley" on one side and the “Earl of Huntington" on the other side. 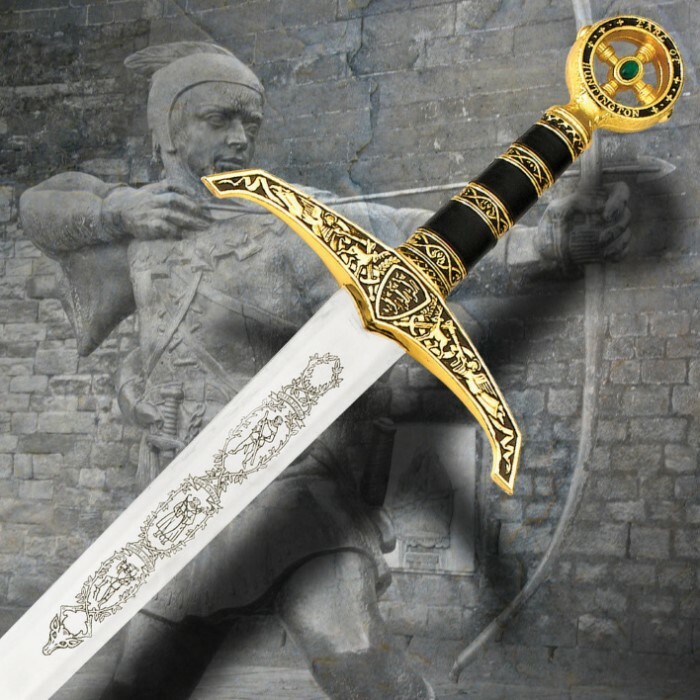 This sword is a superb item that will make a valued addition to any collection! Large and heavy sword at a reasonable price. Meant for display purposes with nice detailing on the hilt, handle, hand guard, and blade. Goes nicely with the Golden Crusader Sword as fixtures along side my desk wall. Would recommend it as a good choice from BudK. i bought this sword for my brother for his birthday and its an awsome DISPLAY sword......DISPLAY SWORD....if you order this dont go swinging it around cause the leather will come off and it will fall apart. Unbelievable size and weight, nice wall plaque. Another Bogo special and the two make a wonderful display in my office. Not a working sword... it's just pretty. my First purchase and i am very shock at how quick i got the sword and the way it looked AWESOME !!! This is the second Robing Hood sword I have. The first one was bought at sword and knife store on vacation. This one by far has the first one beat. Up next to it the first one looks like junk. The one from Budk looks, feels, and displays a excellent quality. It set the standards to other Robin Hood swords for me. It also is identical to the one in the Kevin Costner "Robing Hood Prince of Thieves. I am the founder of an anachronistic reenactment guild. Upon full membership into the guild, each member goes through a knighting ceremony. I bought this sword originally to use as a dress blade, but I found it to be too big and clunky for standard wear. The fittings loosen up very easily, and there seems to be no way to tighten them. Since then I have placed it on loan to my troop indefinitely for a ceremonial knighting sword. You can't beat the looks of this sword for that type of thing. It also looks great on the wall. The best looking "Robin Hood" sword I've encountered yet. It's a great show piece, but defiantly not for carry or reenactment. Just got it, and im iVery impressed. I had excellent service, and the sword arrived right on time. Its completely dull, but the finish on the blade is amazingly smooth. in the picture you cant really make out what the blade or hilt engravings are, so i was worried they might not show well on the sword. But it looks Great, with clean, clear pictures. i will be buying from Trueswords again for sure. This is a very nice sword! Came really fast and packed very well. Couldn't ask for any thing better. Great service from every point of view!